The Sit N Stand Ultra stroller has multiple riding positions, allowing children to sit or stand along the ride, or use an infant car seat in both the front and rear facing seats. The Sit N Stand Ultra stroller can accept one or two infant car seats, (sold separately) all Baby Trend infant car seats, and select models from other brands to create a travel system. 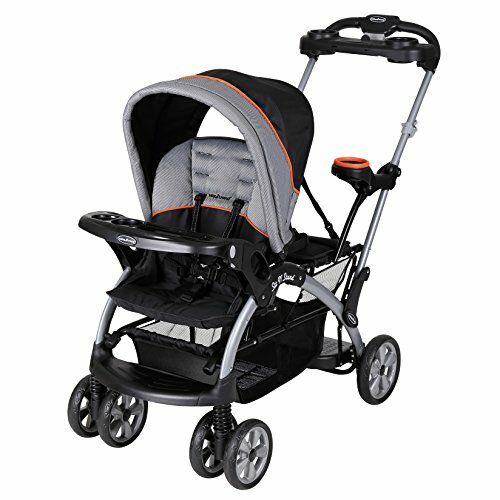 Please refer to our car seat compatibility chart for more information: http://www.babytrend.com/faqs_carseatcompatibility.html.Folds compactly for easy storage and travel, large storage basket, and has a foot activated brake. The unique rear facing seat allows your older child, (up to 50 lbs.) to ride or they can easily forward face to stand on the sturdy stand on platform. The child tray conveniently can swing away allowing even older children easy access to the front seat, the parent tray has covered storage with cupholders, with a second child cupholder for your older standing or rear facing child.